I've been asked to share a few favorite Amish heritage recipes. 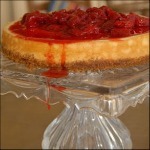 First I'll share a wonderful Kasekuchen (German cheesecake) recipe that I've made for years. It's a bit fussy, but so worth the work. In Germany, this is often served with coffee at breakfast. Next I'll share my husband's very favorite dessert (and it tends to show up at the Yoder family reunions, as well), Graham Cracker Fluff. 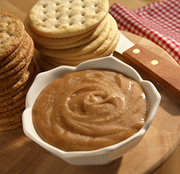 Lastly, I'll share from Esther Keim's cookbook Homemade Goodies an awesome traditional peanut butter spread. Everyone loves Amish peanut butter spread, and I think the recipe from Esther Keim is the BEST! (To purchase her book, filled with authentic Amish recipes, click on the book title above or click this LINK ) Enjoy! Cream margarine or butter with sugar until light and fluffy. Blend in egg. Add flour in small amounts until blended. Pastry dough will be soft. With rubber r silicone spatula, spread mixture on bottom and 1 1/2 inches up the sides of a 9 1/2 inch springform pan. Place in 450 degree oven for 5 minutes. Set aside. *Lower oven temperature to 250. Combine cream cheese, sugar, flour, and vanilla. Mix at medium speed until well blended. One at a time, add eggs, making sure to mix well after each addition. Stir in milk. Pour filling into pastry-lined pan. *Bake at 250 for 15 minutes. *Turn oven temperature up to 300. Bake until set--about 25-35 minutes. Cool. Remove side of pan. Allow kasekuchen to chill for several hours--best if chilled overnight. Add fresh sliced strawberries to top or topping of choice.Cut into 16 slices. Beat egg yolks. Add sugar and milk. Cook on low heat until slightly thickened. Soak gelatin in cold water. Pour hot mixture over gelatin and stir until smooth. Chill until slightly thickened. Add stiffly beat egg whites and whipped cream to mixture. Combine melted butter, and sugar. Mix well. Sprinkle half of graham cracker crumbs in bottom of dish. Add filling. Sprinkle remainder of graham cracker crumbs over top. Let chill until set. Serves 8. Combine brown sugar, corn syrup, water, and maple flavoring in a medium saucepan. Bring to a boil. Remove from heat and let cool. Blend together peanut butter and marshmallow creme. Stir cooled syrup into the peanut butter mixture. Serve with crackers, bread or muffins. If that "Mrs. Eli J. Yoder" who shared the graham cracker fluff recipe is my aunt, then I will vouch for the awesomeness of this dish! She makes a wooonderful fluff. Just love that stuff to this day. Now I'm wishing for a Yoder gathering...LOL.